It is important that surgery be done on an empty stomach to reduce the risk of vomiting during and after anesthesia. You will need to withhold food for at least 8 to 10 hours before surgery. We usually recommend giving no food after 10:00 PM the night before. Water can be left down for your pet until the morning of surgery. We do everything in our power to ensure our patients are safe under anesthesia. We've chosen to use Alfaxan for induction. Alfaxan is the shortest acting FDA approved injectable anesthetic drug on the market, causing less bradycardia (slowing of the heart) and less hypotension (low blood pressure) than other induction drugs. Alfaxan is safe for puppies and kittens, maternal patients, and other animals who typically have trouble with other drugs such as sighthounds. It has been tested at 5 times the standard dose in cats and 10 times the standard dose in dogs and proven SAFE again and again. We strongly believe this is the safest induction agent for our patients. We use multimodal anesthesia (meaning we combine medications that work concurrently to use small doses of each) producing a safer, light anesthesia comparable to the "twilight" anesthesia your dentist offers. 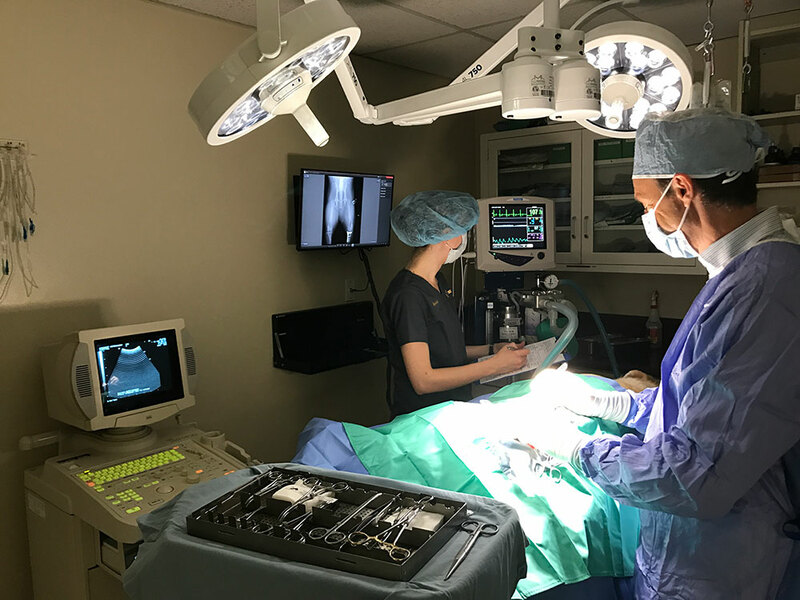 Each patient has a dedicated surgical technician closely monitoring their vital signs, including blood pressure, heart rate, and level of oxygen in the blood, while the doctor performs the procedure, ensuring instant action if any anomolies arise. We offer two levels of basic blood testing before surgery, which we will go over with you when you bring your pet in. Our doctors prefer the more comprehensive screen, because it gives them the most information to ensure the safety of your pet. For geriatric or ill pets, additional blood tests, electrocardiograms, or x-rays may be required before surgery as well. For some surgeries, such as spays, we use absorbable sutures underneath the skin. These will dissolve on their own and do not need to be removed later. 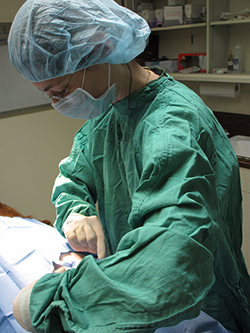 Some surgeries, especially tumor removals, do require skin sutures or staples. With either type of suture, you will need to keep an eye on the incision for swelling or discharge. Most dogs and cats do not lick excessively or chew at the incision, but this is an occasional problem you will also need to watch for. If there are sutures or staples, these will usually be removed 14 days after surgery. You will also need to limit your pet's activity level for a time and no baths are allowed for the first 14 days after surgery. Anything that causes pain in people can be expected to cause pain in animals. Pets may not show the same symptoms of pain as people do; they usually don't whine or cry, but you can be sure they feel it. Pain medications indicated depend on the surgery performed. Major procedures require more pain relief than things like minor lacerations. Cats do not tolerate standard pain medications such as anti-inflammatory drugs, but it's still just as important to make sure cats are pain-free. Recent advances in pain medications have allowed for better pain control in cats than ever before. You may be sent home with a liquid pain medication for your cat that can be absorbed by the gums. After surgery, pain medication is given on a case by case basis. Injectable pain medications may be used after surgery on both dogs and cats. Any animal that appears painful will receive additional pain medication. Providing whatever pain relief is appropriate is a humane and caring thing to do for your pet.